New May special! Receive a beautiful Chinese pottery shard pendant FREE with a $25 Purchase! Perfect for summer and rich in color, these Chinese pottery shards have the Bead Bazaar in a buzz! Each piece is silver-plated and has a jumpring attached, making them the perfect pendants. Best of all, from now until June 20th, we are giving away a FREE pendant with any purchase $25 and up! While it’s suspected that our pieces date back to the Qing dynasty, which ruled from the mid-17th to the early 20th centuries, their ages are difficult to verify. 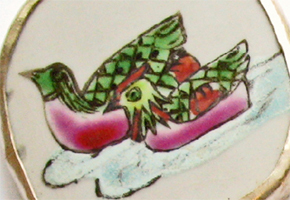 However, it’s clear from the various motifs that the pottery told stories. Made from true broken pottery remnants, but no too pendants are truly alike. Many pieces are decorated in vibrant hues, from yellows to reds to teal. These colorful shards feature birds, dragons, lions, and various flowers. Pumpkins and other gardening images also abound. It is believed that the stylized blue and white motifs commonly found in Chinese pottery originated with the Tang dynasty, which ruled from the 7th-10th centuries, while the oldest surviving pieces of blue and white pottery date back to the 8th and 9th centuries. Blue and white porcelain proved to be a lasting motif, and is still produced now, centuries later. 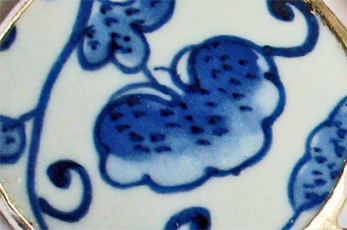 Blue and white porcelain even became so popular that it was exported to Japan. With so many vibrant colors and lively patterns to choose from, let your inspiration abound! Come by to see these one-of-a-kind pieces of history. And remember, you can take one home for FREE if you spend $25 or more! Free Interactive Beading Technique Demonstrations! Beading is rapidly growing in popularity, and who can be surprised? Beaders are attracted to the possibilities of a custom designed piece, and enjoy letting their creativity loose. As more people come in to stretch their creative wings for the first time, more options in beading lessons become available. We currently have three levels of bead technique instruction available at the Bead Bazaar. For more independent learners, FREE step-by-step instruction sheets are available on a multitude of beading and stringing techniques, from attaching clasps to building earrings. These sheets are clear, concise, and best of all, illustrated! They provide wonderful instructional media for those who can easily read instructions and follow along. At the other end of the spectrum is the traditionally formatted classes. These provide step-by-step instruction from start-to-finish on a project. Class price varies depending on the length of the class. These allow beaders to get helpful advice from staff through the entire beading process. Again, the techniques learned are various, and taking longer classes allows projects to become more complex. Classes are also fun because they result in a completely finished project, the spoils of a beader’s victorious efforts. More info about our summer class schedule can be found at Bead Bazaar’s website. For those who just need a little help, we now provide a FREE middling level of instruction, our interactive demonstrations. Perhaps you have a necklace strung, and just need to attach that clasp? Or maybe you’ve been practicing a technique, and want to ensure that you’re doing each step properly? 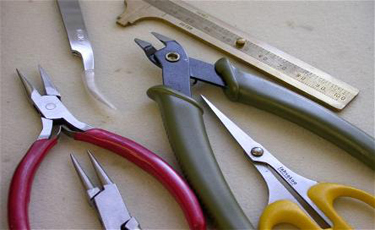 Do you just have questions about the tools, technique, or supplies for a project? Starting in June, we will be providing free interactive demonstrations for the more simple techniques of beading. Our first free demo is on Sunday, June 6th, from 11AM to noon; this hour-long session will be dedicated to the techniques used in simple earrings. The following Sunday, June 13th, we will cover the various ways of attaching a clasp to cord or thread, also from 11AM to noon. For both sessions, our staff will demonstrate, and you can use the provided tools and supplies to practice; or perhaps bring in your own mostly finished projects, and take advantage of an interactive atmosphere to finish them off in style. Unlike a class, there will not be enough time to build a project from start to finish; rather, these free demos focus entirely on the specific beading technique. The exercise samples made during these demos are just going to be practice samples, unless a beading project is brought in. We invite everyone to come and share their own beading knowledge, and will answer any questions about the hows and whys of beading, from tool use to choice of supplies. These beginning beading demos will teach the building blocks for beading, providing a jumping off point for experimentation in more complex projects. Our max capacity for these demos is eight people, so while registration isn’t required, it will guarantee you a spot. We are really excited about these interactive demos, and hope to continue them through the following months. In the mean time, you are invited to our free demo debut on Sunday, June 6th, at 11AM- think “earrings”. We hope to see you there!